Combining cuisines is one of my favorite things to do. Give me a Thai lemongrass burger, Chicken Pot Pie Samosas, or a Mexican Hot Chocolate Milk Shake and I’m a happy camper. Or, as you see here, some core Indian flavors, wrapped up in a corn tortilla taco bite. 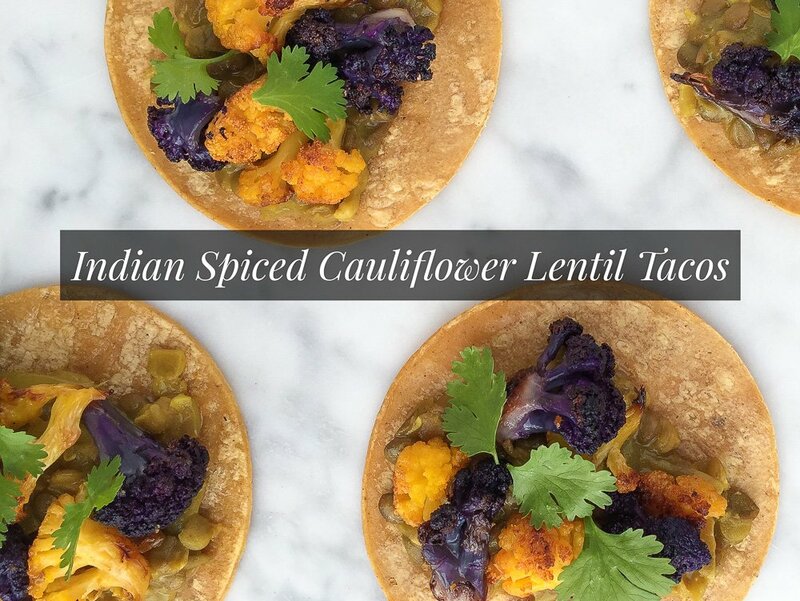 These tacos are bursting with flavor – the coconut daal provides a grounding, savory/sweet base, while the cauliflower is slow-roasted until its edges caramelize and turn crispy. These tacos are one of my go-tos for immune boosting as well, owing their awesome health benefits to a few key ingredients. Garlic is one of the best anti-bacterial, anti-viral and anti-fungal ingredients around, besting bacteria that even antibiotics have trouble with. It’s great when you have a cold or flu, but also to generally keep your immune system in tip-top shape (medical researchers are engaged in preliminary, promising trials as to its anti-cancer effects). The only problem? Garlic’s health-benefitting compound, called allicin, takes up to ten minutes after crushing or mincing the garlic clove to form, and it’s very sensitive to heat – so many of the recipes that utilize garlic end up destroying much of its goodness (it also burns very quickly – it kills me to see people throw garlic in their onion sauté at the beginning of making a soup or sauce, as its fragrant spice will often turn bitter with overcooking). This recipe adds the garlic at the very end, after the heat has been turned off. 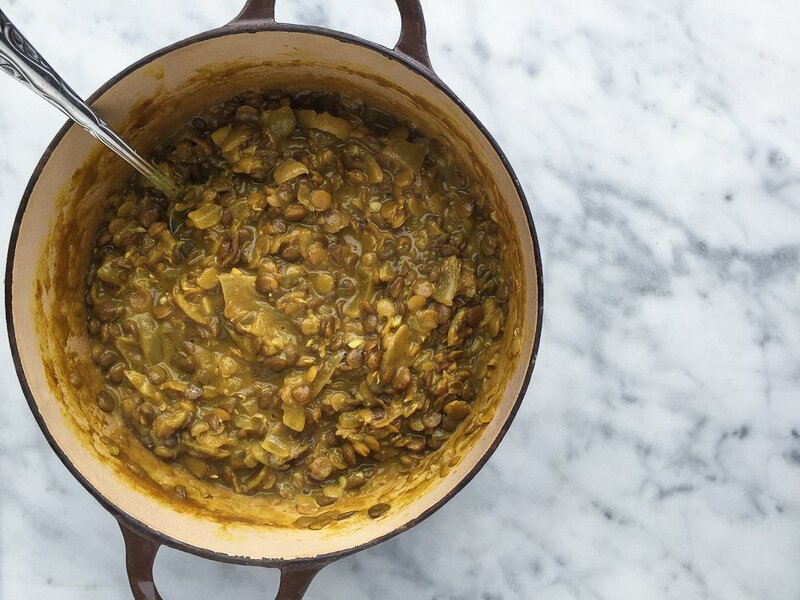 The warmth of the lentil mixture cooks the garlic very lightly, just enough to reduce its bite while preserving all of its wonderful healthy properties. Coconut is one of the only food sources of lauric acid (the other primary place that it’s found is breast milk, which gives you a hint as to how important it is for human vitality). That, combined with its caprylic acid, account for most of coconut’s amazing immune-boosting properties – it’s anti-viral, anti-bacterial and anti-fungal, and has been proven effective against bacteria from staphylococcus aureus (otherwise known as the highly-dangerous, often antibiotic resistant staph) to candida, or yeast overgrowth. While coconut is high in fat, it’s stored differently in your body than other fats, going straight to your liver where they’re turned into immediate energy or ketones, rather than being stored in your body’s fat cells. In fact, coconut has been shown to help people lose weight, especially in the stomach region (one of the most dangerous places to store fat for humans. 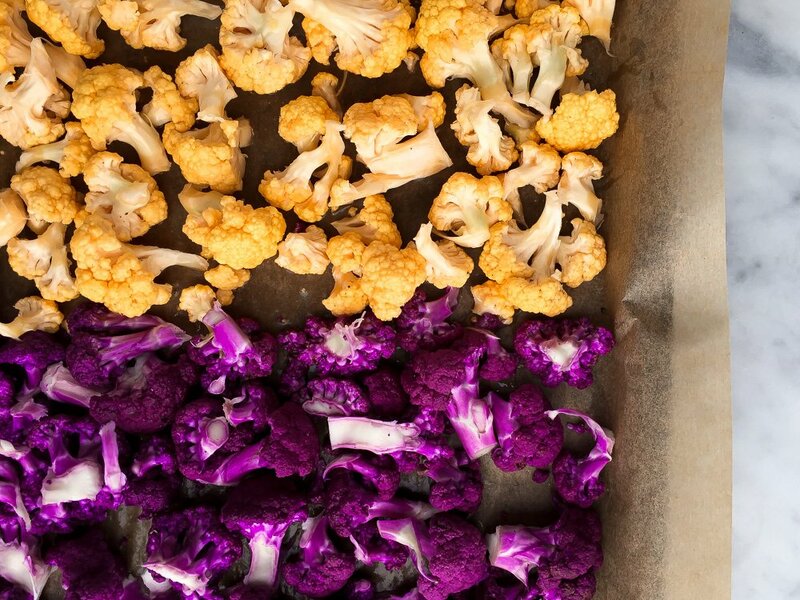 The purple and orange cauliflower that I used contain additional antioxidants that give them their rich pigment, but the more typical white cauliflower will work wonderfully in this recipe, and is a health superstar on its own. Beyond taking on an amazing caramel crunch when roasted, cauliflower is rich in health benefits. It’s an excellent source of vitamin C, vitamin K, folate, pantothenic acid, and vitamin B6. The vitamin K, in combination with cauliflower’s sulfuric compounds, work to stop body inflammation at the source, while the vitamin C keeps the immune system in tip-top condition. 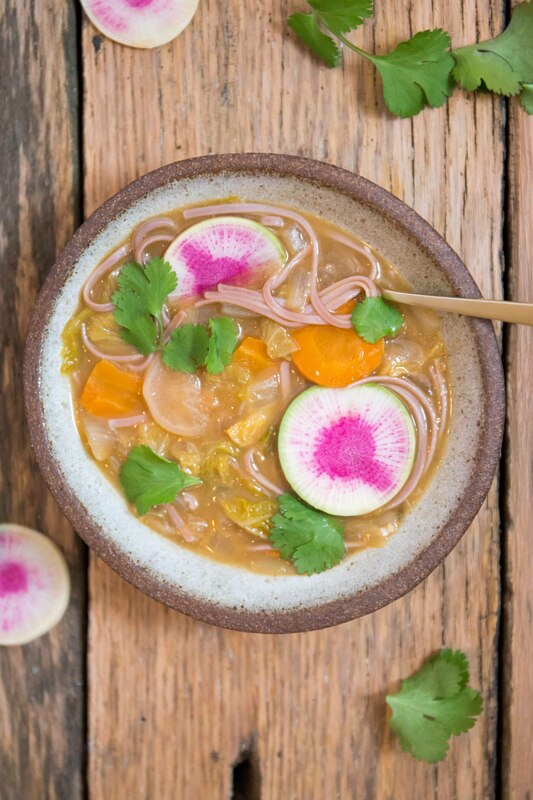 You’ll notice that this recipe calls for soaked lentils. 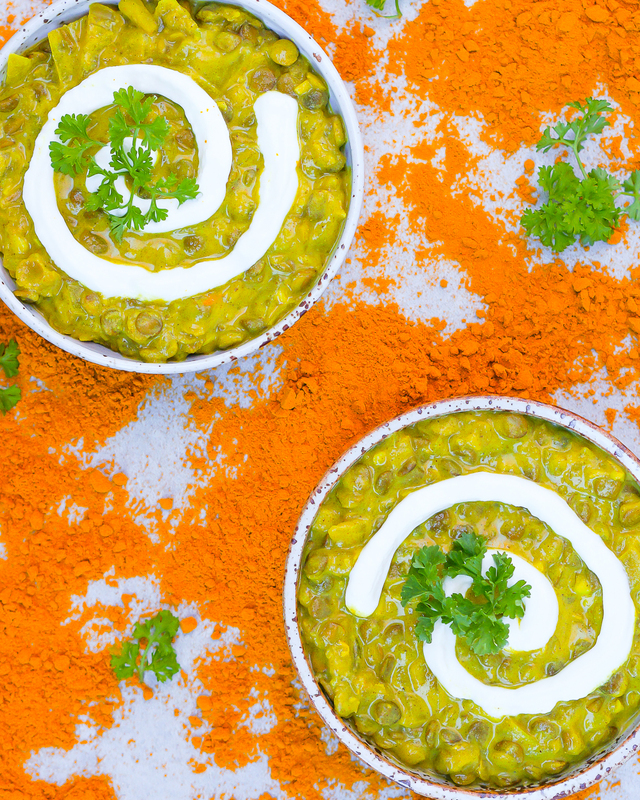 You don’t have to soak your lentils (it’ll taste great either way), but I prefer to, for several reasons. Traditionally, grains, nuts and legumes were prepared by being soaked in an acidic medium for 12 – 24 hours before being cooked. This does a number of things: it neutralizes the phytic acid, which can bind with certain minerals in an ingredient and cause them to pass through your body (meaning you won’t get the full nutritional benefit of the food you’re eating). Soaking also makes the food much more digestible, often completely eliminating the belly aches or gas many people experience after consuming beans or nuts. Picture a seed that you would plant in the garden: it’s packed with goodness, but that goodness is locked inside of it until a combination of factors (the sun, soil and water) give it the “unlock” signal, causing it to sprout and begin to release that goodness. Soaking acts as a kind of “unlock” signal, allowing the nutrients inside grains, nuts and legumes to become available for release in your body. It’s easy to do too: just place your ingredient in a big bowl, cover with water, add some sea salt and a splash of apple cider vinegar, and let sit loosely covered or with a towel over for 12 – 24 hours. 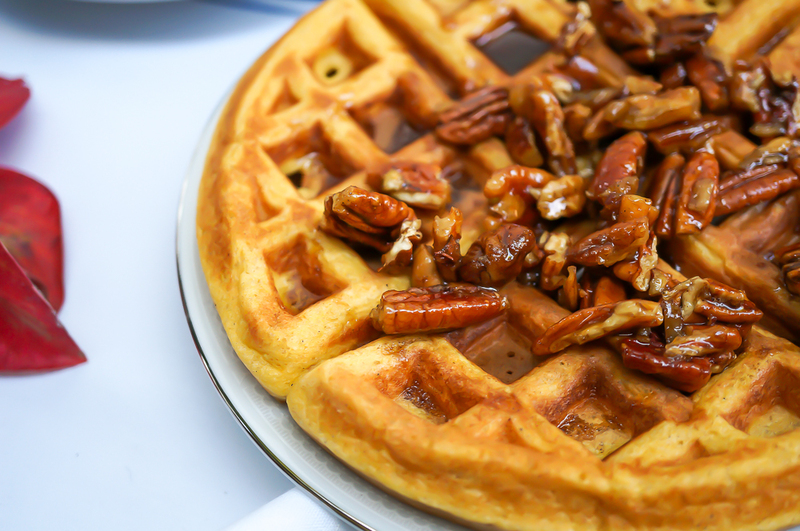 Drain and rinse your grains, then use in the recipe as called for. For more on soaking, see here. Preheat the oven to 400 degrees, then arrange the cauliflower on a parchment lined pan. Toss with the melted coconut oil and a generous sprinkle of sea salt, then put in the oven to bake, stirring once or twice, until edges are golden brown, or about 45 minutes. Meanwhile, in a medium pot, cook onion in coconut oil over medium heat until translucent. Add the spices and cook for 3 more minutes or until fragrant. Add the lentils, vegetable broth and coconut milk. Bring to boil then reduce heat to low and simmer uncovered for 30 – 45 minutes, or until the lentils are very soft and have absorbed most of the liquid. Turn off the heat and add the garlic immediately and stir (this cooks the garlic enough to mitigate the intensity of the flavor while preserving all of its health benefits). While the daal sits for a moment to thicken up, heat a very small amount of coconut oil over medium-high in a large saucepan, wiping out any excess. Place tortillas in the pan for 30 – 60 seconds per side, or until warm and flexible. 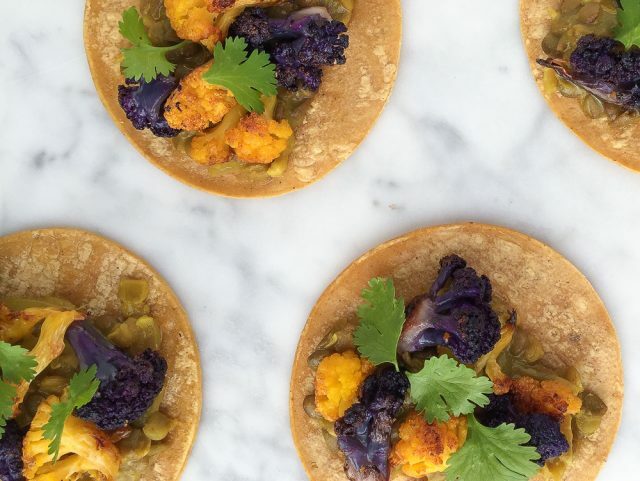 To assemble, spoon daal onto tortillas, then top with cauliflower and cilantro, if desired. Makes 10 small tacos, with a bit of daal leftover. I am LOVING this combination of flavors! I’m totally with you on combining different cuisines as well—- my recent favorite has been mediterranean and mexican 🙂 Falafel tacos for the win! Yum! I can’t wait to try this. I’m also using coconut milk as a suttbisute for heavy cream in our pumpkin pie this year. Hopefully it will turn out well. Happy Thanksgiving, my dear. Yum! I can’t wait to try this. I’m also using coconut milk as a situbutste for heavy cream in our pumpkin pie this year. Hopefully it will turn out well. Happy Thanksgiving, my dear.